China's real GDP growth exceeded market expectations, rising 6.8% year-over-year in the fourth quarter of 2017. Overall, the economy maintained strong momentum going into 2018 – driven by services and new economy sectors – and possibly lending support to the equity market. Citi analysts are positive on China's macro outlook, which should support earnings growth in the next two years. Citi expects China equities to deliver 20% earnings per share (EPS) growth and 16.1% return on equity (ROE) in 2018. While for 2019, Citi analysts are anticipating 16% EPS growth and 16.4% ROE. Citi believes China is becoming less cyclical and better able to withstand shocks, due to its rising new economy and innovation. Citi analysts estimate that China's new economy already accounts for 21% of the country's GDP, which will increasingly serve as a growth driver for China. 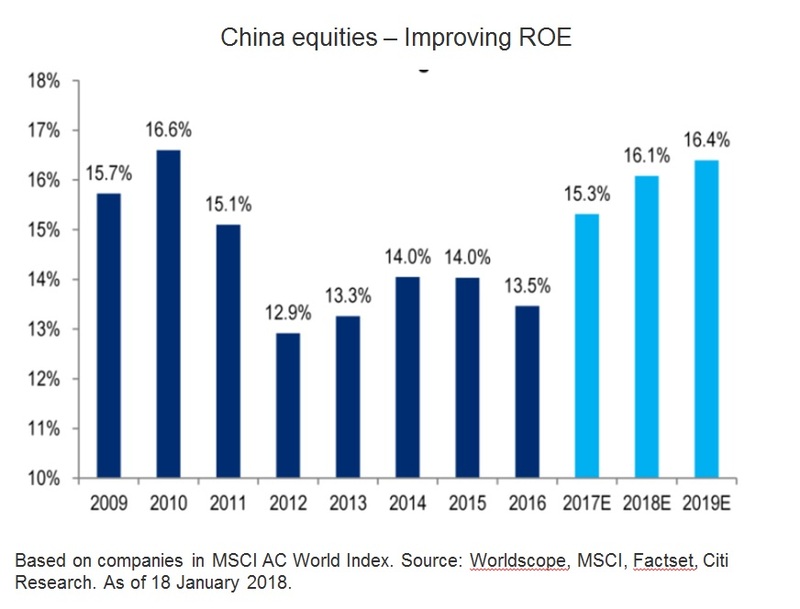 China equities – Improving Return on Equity (ROE) While industrial growth in automobiles, chemicals, metals and mining slowed in 2017; other high-end sectors such as IT, pharmaceuticals, electric machinery and special equipment all had robust growth. This led to better-than-expected industrial growth, not to mention the strong service sectors. As such, Citi remains confident on China's economic outlook and the equity market. While growth may be peaking out, a sharp slowdown is not expected in 2018. In fact, earnings growth is likely to remain decent. Sector-wise: Citi analysts prefer financials, cyclicals (property and oil) as well as healthcare in the near term.